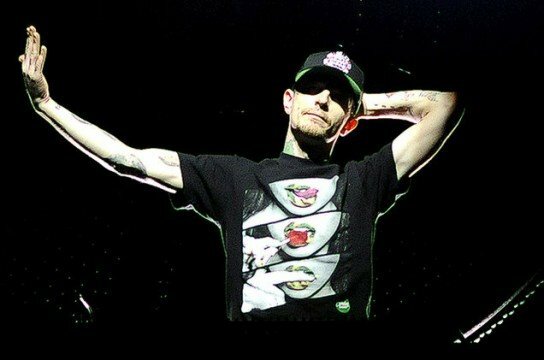 You might expect that a progressive house virtuoso and decorated Twitter troll like deadmau5 wouldn’t have any interest in collaborating with a pop star, but as long as the star in question isn’t Justin Bieber that’s apparently not the case. He recently reached out to “The Hills” singer The Weeknd about the prospect of a collaboration. deadmau5 tweeted to The Weeknd to show him a work in progress that he uploaded to his SoundCloud account with the title “Cat Thruster System” shortly beforehand. After making a minor changes, he uploaded a second version titled “diesel powered cat thruster” and tweeted again. In addition to the gesture being generally out of character for the ‘mau5, it bears mentioning that the bass line of “diesel powered cat thruster” has a lot in common with that of The Weeknd’s “Can’t Feel My Face.” They’re not quite in the same key, but are rhythmically and tonally similar. Perhaps the congruity was what prompted deadmau5 to approach The Weeknd in the first place, but it doesn’t seem like the sort of thing that would elicit the response he might be hoping for. Nonetheless, if a collaboration between deadmau5 and The Weeknd becomes a reality, both artists will surely make it known on social media well ahead of its release. Until then, however, fans can still look forward to the former artist’s long-awaited collaboration with Swedish DJ/producer Eric Prydz.